Mary E. Brown, 97, a longtime Euclid resident, passed away Aug. 18, 2013. 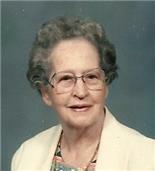 Mary was born March 7, 1916, in Connellsville, Pa., and moved to Euclid 70 years ago. She was a charter member of the former Masters Church in Euclid, and was a secretary for the City of Euclid, retiring in 1982 after 20 years of service. Mary is survived by her daughter, Arline Richardson; sons, Stuart (wife, Bette) and Alan (wife, Camelle); eight grandchildren; and five great-grandchildren. She was preceded in death by her husband, Richard W.; and brothers, Edgar A. Blair and G. William Blair. Funeral Services will be held 10 a.m. Thursday, Aug. 21, at the Funeral Home, where friends will be received from 5 to 8 p.m. Wednesday. Interment will be at Western Reserve Memorial Gardens in Chester Township. Memorials may be made to Hospice of the Western Reserve, 300 E. 185th St., Cleveland, OH 44119.